WELCOME TO SUMMER POLE VAULT CAMPS @ FLYING CIRCUS !!!! Are you ready for a Summer Pole Vault Adventure ????? You and your friends are cordially invited to our FLYING ADVENTURE SUMMER POLE VAULT CAMPS in Warwick, New York this summer. Our 6 Pole Vaulting Pits and runways will be filled with outstanding pole vault coaches and councilors to help you learn the modern day techniques of Track and Field most intreging event ~~~ Pole Vault. We will have Beginners ability groups and Intermediate and Elite groups for all boys and girls in grades 6-12. The 2-Day camps offer 8 hours of safety instruction…and progressive drills for championship pole vaulting at every level. Our GIRLS CAMP will be Monday and Tuesday afternoons…July 8-9, 2019 at our Warwick Flying Circus headquarters. Our BOYS CAMP will be Thursday and Friday July 11-12, 2019. Our camp registration forms are located at our web site www. hvflyingcircus.com and we limit our camp to the first 50 athletes who register with full payment. We are currently at 65% enrolled in both camps….. if you plan to be with us this summmer camp… you should register and mail forms ASAP to secure your spot. Camp cost is $295 per athlete and we go Rain or Shine with our Indoor Facility. Please join us this summer for the”FLYING FUN” !!!! FOLLOWING CAMP WEEK… We offer our “BEST POLE VAULT MEET of the YEAR” here….. and we want you to join the competition and BBQ!!! BOYS HS….OPEN…MASTERS ATHLETES…….Registration 12 Noon…Bar goes up at 1PM<...Entry $40 per athlete (Includes BBQ Lunch Saturday Afternoon) THis event is our season ending activity.... Join the Fun...Music...and Half True pole vault stories .....JOE TEA WIL BE SERVED @ Rich Murtie's BBQ EXPRESS TRADITION !!! If you would like to VOLUNTEER to HELP with Meet scoring..Bar placements..Registration or Clean Up...... YOU EARN THE VOLUNTEER T-SHIRT for the DAY!!!! Contact COach St at coachst@gmail.com if you can help in any way... This meet is getting BIGGER each YEAR!!!!! Many thanks in advance. 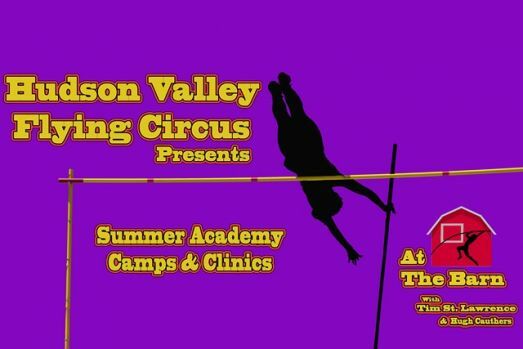 CIRCUS SUMMER ALL-COMERS TWILIGHT POLE VAULT MEET SCHEDULE….JOIN the FUN!! MIDDLE SCHOOL VAULTERS SET NEW SCHOOL RECORDS!!!! The New Middle School “FIBER-BENDERS” came out BIG this week and s et 3 New PV Records….. Leading the charge was seventh grader ..LILLY ANN BEATTIE of Warwick Valley Middle with her new all time school record 8′ 7′ leap from 7 lefts…breaking Lillian Greibeslands 8′ 6″ old mark for the Purple Wave. Adding a New 6th Grade record from Warwick Valley Middle…was Warwick Track Club’s Rachel Venter..with her 7′ 6″ sail on her new pole…. the final MS record was by Ella Galloway of Pine Bush Middle … with her 7′ 0″ clear for the speedy seventh grader. Leading the Boys Middle was Ben Waters(Warwick) at 6′ 6″ and Ryan Aronov(Warwick) at 6′ 6″!!! CONGRATULATIONS NEW WAVE!!!!! FLYING CIRCUS will be CLOSED EASTER SUNDAY APRIL 21 and SUNDAY MAY 5 ……….ENJOY YOUR FLYING!!!! “FLY-CIRCUS” @ TEXAS RELAYS ~~~~ KAELI THOMPSON hits Target — 13′ 6″ (4th Place) !!!! This was the theme and attitude posted up on the University of Texas Football Facility front door …as I walked into my first CLYDE LITTLEFIELD TEXAS RELAYS extravanganza this past weekend with Coach Mike Potter,Coach Curtis Ackacki, Greg Thompson and pole vaulter Kaeli Thompson. This 92nd Running of the Texas Relays was a treat for the ultimate Track & Field Nuts attending. Everything was first class…. and the the Texas Exes and constituents from around the campus teamed up to establish the …..”Texas Fans Make Us Proud” initiative to promote good sportsmanship at all athletic events for the University of Texas. The University of Texas is a leader of college sportsmanship and they make UT sporting events a model for safety, civility and team pride. THANK YOU UT for showing us the model…… “EVERYTHING MATTERS”. Friday- March 29.. The Girls High School Championship Pole Vault event kicked off at 4:15pm..with a Texas Tailwind and the Top 10 Girl High School Vaulters were ready to fly. Warwick Valley,NY senior..Kaeli Thompson…Coached by Mike Potter and Curtis Ackacki was ready coming off her NB Pole Vault National Championship Indoor meet. Using her BIGGEST Poles ever.. she flew to a New School and Section 9 record with her 13′ 6″ clear on her 14′ 1 x 170 stick. She had two close bars at 13′ 9″ and placed 4th overall in her opening outdoor meet. It was also the 4th Best Vault on NY States All Time Outdoor list!!! CONGRATULATIONS KAELI!!!! * Special Thanks to all our Coaching Staff for covering our instructional classes this week. It takes a village to Run-the-Circus and eveeryone always come thru to keep the Vault Train Rolling forward. * Sorensen Consulting Pole Rentals and Sales are going strong again this spring. All athletes needing poles for the spring Track Season should connect with Bob Sorensen ASAP…. as the season is now revving up fast. All Indoor Rented poles should be returned by now to avoid any late charges. Thank you for helping fund our Pole Rental/Sales Project this year. * Our Wednesday Night Open Vault Sessions have just 2 weeks to go. We willbe open April April 3 and April 10 at Regular evening times to help all vaulters get ready. WEDNESDAY NIGHT OPEN SESSIONS END APRIL 10. … as the Circus Coaching Staff will be at various dual meets during the weekdays and Saturdays. We will still have instruction every Sunday at Regular times posted. ((We will be closed for EASTER SUNDAY… April 21… for Family Bonding). * Our Summer Pole Vault Camps are filling up FAST NOW… If you plan to be with us this Summer(July 8-12) registration forms are at our web site www.hvflyingcircus.com. We limit this summer camp to a first register/first served policy. Beginner levels/Intermediate Levels/ Elite Levels of Instruction….Four outdoor Pits/2 Indoor Pits/excellent instruction/Fun for all — Join us this summer @ Flying Circus. * Our BBQ “AIR-RUSH” Pole Vault Meet will be held Friday Evening July 12 for Midddle School and Freshman Divisions athletes only. Our BBQ “AIR-RUSH” Meet for all others will be Saturday July 13…Girls Division 10AM Boys Division 1:45PM… BBY at 2PM. Music …Fun….Great Food!!!! * CONGRATULATIONS to JENN SUHR for an unbelievable TEXAS RELAYS 16′ 1.5″ Leap to gain the global lead again. This warrior..at age 37..refuses to quit . She had 2 close bars at an American Record 16′ 5″!!! Also a shout out to Dane Sorensen for another great win at Widner Invite this weekend at 15′ 7″ for the Cortland University Red Dragons!!!! FLYING CIRCUS…. KEEP TRAING with a PURPOSE.